After Ilhan Omar spoke of the dangers of blaming the world’s Muslims for 9/11, the NY Post maliciously quoted her out of context, with a photo of the attacks. 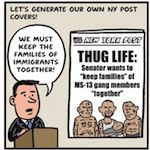 Cartoonist Jen Sorensen brainstorms some new NY Post covers. 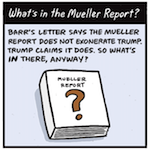 Cartoonist Jen Sorensen fantasizes about what the infamous (and soon to be redacted) report might actually contain. 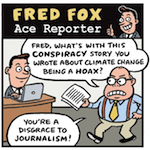 Cartoonist Jen Sorensen imagines the repercussions that would ensue if a rogue reporter kept spreading misinformation. How is a whole rogue network given a free pass? 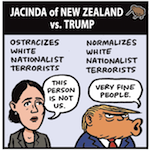 Cartoonist Jen Sorensen compares the reactions of New Zealand’s Prime Minister Jacinda Ardern and Pres. Trump to domestic terrorist attacks on Muslim communities in their respective countries. 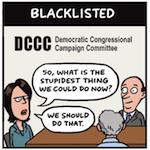 Cartoonist Jen Sorensen illustrates several species who are often mistaken for actual civil rights activists. 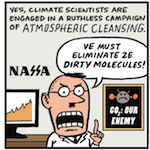 Did Trump’s pick to lead a climate change panel actually compare environmentalists’ attitudes to carbon dioxide to Hitler’s demonization of Jews? Why yes, yes he did. 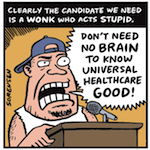 Cartoonist Jen Sorensen considers the implications.